Summary: The story of No Game No Life centers around Sora and Shiro, a brother and sister whose reputations as abnormally brilliant Hikikomori(shut-in) NEET gamers have spawned urban legends all over the Internet. One day, they are summoned by a boy named Tet to an alternate world. There, God has declared Ten absolute pledges summarized: "Everything is decided by games.". Kings, Wealth, Ownership, and even national borders are decided by a game. Humanity has been driven back into one remaining city by the other races. The story follows them as they set forth in this new world. First Impression: Once more, the show I expected the least of from summaries, has become one of the top interesting shows in my lineup. This one feels like the absurdity of Kill la Kill, run through the tone and pace of Spice and Wolf. First Opinion: Hoo boy. How to talk about that first episode and do it justice without spoilers...mm. To be up front, as a start, I was expecting this to just be a cheap bandwagon level show on the back of 'Mondaiji-tachi ga Isekai'. It sounded exactly like it. In central theme, I suppose it is. A world ruled by games. Only this time, it is actually games, and not super powers filtered through and wagered on games. If I had to summarize the first impression that made me realize this was going to be worthily different from Mondaiji-tachi, the first thought that occurred to me was 'Detail'. Specifically, Depth of Detail. 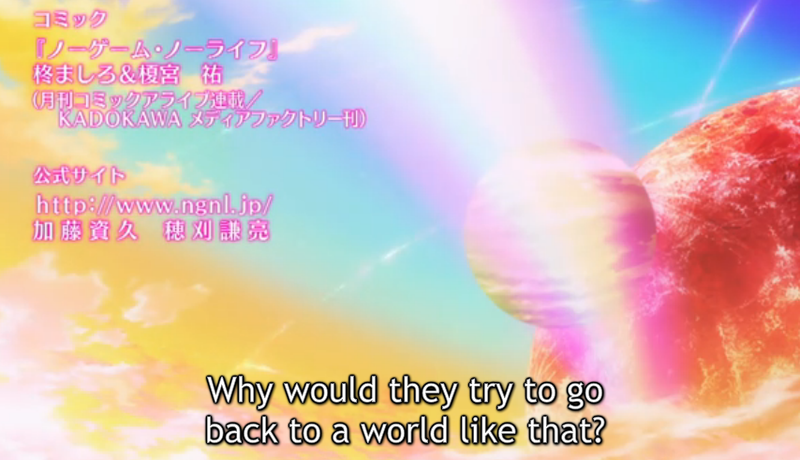 Just in one episode, they have achieved a world that feels much more deep and detailed than Mondaiji-tachi did. Mmm...what else to say. Ah yes, the main characters, contrary to what summaries made me think, are very interesting. They aren't just Hikikomori NEETs for the sake of being them, in just one episode they feel like they have sound reasons for their life style. Like it was something they chose for themselves, rather than just a role they arbitrarily filled for the sake of character traits. All this, despite them never explicitly stating the reasons why they think and live this way, just the general philosophies that they presently hold. As an added bonus, they feel like the genuinely bonded siblings, rather than like two people slotted into the siblings role to create shallow romantic tension. They had several opportunities to play shallow comedy tropes with the siblings, but instead they come across as mutually devoted siblings, two people who have lived their lives together and become accustomed to one another. Typically, I have no interest in characters labeled by or tagged as NEETs, and I'm somewhat less stigmatized on shut-ins but feel unfavorably towards them. The reason being, the tag of NEET tends to confine and define a character branded with it. The first instance of characters breaking away from this for me, was Kami-sama no Memochou, where NEET was an element of the character, instead of the character trait that defined and shaped everything about them. Finally, the world itself is interesting in its own right, visually and by principle. In Mondaiji-tachi, (does it feel like I'm beating the dead horse yet? ), the world was interesting more as a colorfully useful stage for interesting events to happen to the main characters, rather than being interesting in its own right. On our present hand however, I am genuinely interested in seeing how this world has been shaped by the Ten Pledges, how they affect everything in it, and how the main characters will explore, discover, and utilize this new world. TL;DRSummaries are as useless as ever, and you still can't get the best information without watching the first episode for yourself. If it sounds super bad in the summary, its usually because the summary itself is super bad.